OK thanks so much guys. I did gather that much thus far. Scuzz thanks!, I did see your pics when researching the OBD II thing (AWESOME!). I didn't pay too much mind to them at the time since you had the RamJet. Although, looking at them now I see exactly what you mean. BTW, you have to pull the dizzy if you pull injectors? Don't you have to do that "crank relearn" all over again!? maybe it's easy, I'm not THERE yet. I know vortec heads need to have intake modified or run vortec TPI. Does stock TPI basplate bolt to Aluminum LT1 heads? (I mean do the ports work), holes don't bother me so much. if you happen to know. I got a valvetrain issue that's got me wanting to machine for guideplates, and machining on L98 iron is a waste (hence Alum LT1). I'm sold on the OBD II swap. just have to get her done to roll her back into storage. OBD II will happen in Spring. Do you guys know of anyone that has done this to a OBD1 GMT400 1227747? I have a 16146299 ecm which is specific to 1992 but basically the same as the 7747. Don't think it would be much different than using 7730 which was the way I was going to go until reading this thread. Saying that I already have a tpi setup minus 350 injectors. I now have since acquired everything else for this swap minus a harness and efi live. FYI, I have read this and all other threads linked on this one. Basically where I stand now is deciding which junkyard harness would be best to work with. My harness should be just a tad shorter than what would be needed for a third gen. Don't want to extend any wires, just want to makeup connections at ecm pins, thinking I might have to buy new wire for injectors and additional grounds. My firewall connector is gutted which freed up more than half it's space. I was surprised to recenty learn that the 01-02 LS1 PCM 12200411 was used in the 01-02 Express Van that still uses the Gen 1 small block (L31) with cam sensor (distributor) and crank sensor with external igniton module and coil (like the LT1). Currently EFILive supports this PCM and offers some pretty cool features (auto VE correction, custom OS, etc). Possibly next weekend I'm going to convert a L98 to work with the 01-02 LS1 12200411 PCM on my test stand. I almost have all the parts. Since I've been rewiring my S-10, I'm going to begin building a new engine harness for these newer electronics. I really like the idea of using the 4L80E with my truck. I haven't read all 22 pages of this thread, but i knew about the 96-99 vortec guys being able to do the 0411 swap in place of the black box PCM, but im really liking that this is being done with the older OBD 1 stuff. I have a 93 S10, that i will be swapping onto a 94 S10 ZR2 frame/suspension and making it a 4wd, i was originally going to keep the 4.3 TBI from the and possibly doing a 5.7 TBI swap. But now im thinking about finding an 01/02 Express Van V8 engine wiring harness and PCM and having the harness modded to be a stand alone. Full tun-ability, one PCM to control the engine and my 4L60E trans and now im thinking of using an LT1 i have, just need the 96-97 timing cover and the crank reluctor wheel. Is there any thing special i need to know about modding the stock harness or is it pretty straight forward? Last edited by HotRodV6; 08-26-2013 at 10:26 PM. I've got a 350 Ramjet/4L60E running in my 41 Chevy pickup that is the best setup I've ever put in older car. I've done half dozen or more, mostly TPI setups, but this is the most trouble free and easiest driving setup ever. I had TPI setup ready to go in my 58 Vette, but because of the truck being so driveable, I've spent all summer taking out OBDI wiring, removing and changing out 700R4 for 4L60E, and installing all the OBDII sensors, and making it just like the truck. It's just a wonderful setup, and a pleasure to drive. I have spent the last 7 weeks reading and re-reading this entire post, and few other related ones. It has given me an idea that will kill a few birds with one stone. It will clean up a lot of parts I have lying around, take "clean out the garage" off of the honey do list, and give me a better running more powerful, more economical truck. Sorry for the long post, but I need to know if I am correct before I start ordering the parts I do not have. What I have is a 1994 Chevrolet S10 disguised as an 1947 International KB-2 I want to put a TPI 350 in it. I originally put this truck together using as many of the S10 components as possible, including the dash panel mainly because repair parts for an S10 are fairly inexpensive. The tired old 4.3 now has 310,000 miles on it and I got a really good deal on a 92 350 long block with 50k miles and a freshly rebuilt T-5. Is this to much pressure for a TPI system? I need to know if the above list is correct, if I am missing something, or recommendations on where I may find these parts cheaper. As this will most likely not be the last time I do this swap, I just got to prove its worth it to my better half. I have been researching this for quite some time now , and am determined to do this swap once I get home from Afghanistan, (this Summer). I know I can get the parts, I already have the engine, Trans, TPI Set up from an 87 Vette, I am not afraid of wiring, and I have the ambition to get it done. The only prohibiting factor for me thus far is the cost for the tuning software, my better half wont buy off on it until I can prove its worth it. She has to see it in action. Dyno time is not cheap either. Is there anyone out there willing to point me in the right direction to an affordable and quality dyno shop in central Kansas? Or maybe someone to flash the PCM initially? Car: 1988 Pontiac Trans Am GTA. If i am running a harness built by Mike for a t56 car, am i able to retrofit a tko600 5 speed in? I noticed there is a reverse lockout solenoid pigtail, as well as a vss pigtail from the ecm... I am a tad confused and though i re-use my current vss connector? I think the 94 harness you are running can be re-worked to use with the 0411 with re-pinning ecm plugs, and running a couple more injector wires to ecm, and removing and extending the injecter plug in at intake. I'm running a 93 S10 blazer gas tank in my 41 Chevy pickup running L31/4L60E setup and I just exchanged the TBI pump, only for a TPI pump. I am using ramjet intake/24# injectors, and adjustable pressure regulator, which I have set at about 45#, and system runs great. You will need a wiring schematic for the 94 S10, and schematic for 2002 van. A little comparison will tell you if you can do it. Check out these guys. A few guys there have done the S10 conversion also. I'm going to install L31 2002 engine in my 2003 S10 this summer, and on it, I just have to run 2 more injector wires. The wiring and ecm plugs are same from about 2000 of above, I believe. I know 2001 and 2002 S10 are, because they also run the 0411 ecm. I have gotten several them from junk yards and re-flashed them for use in van conversions. PM me for schematics if you need them. Since doing the 41 pickup over the last few years, I am about to finish a 58 Vette, that was originally set for TPI/730 ecm, but I love the way this conversion runs, I have gone back, changed trans to 4L60E, and installed 02 Van and 0411 in it. The S10 will be next. You will not regret doing the conversion. I plan on ordering all of these parts this month, I really want to know that everything will work. I want all of them to be a my house when I get home. What plugs and wires would you recommend? Thanks, I may just hit you up on that offer for schematics and maybe get you to re-flash my pcm. Last edited by sixty8c10; 03-03-2014 at 09:29 AM. I need to pose question about how to idle down TPI throttle body after I have done this changeover. It's not OBDI any more, so I was afraid to short out pins in ALDL, like the method on this site. I've used that method couple times on old systems but I'm not comfortable trying without some input from you guys. Any help or opinions will help. I would run a 4L60E, otherwise you get into tuning issues with the 411. And you shouldnt need the tach module if you use the 411. How strong is the vortec timing cover? I have the old style engine block and use a cam button and I dont want the timing cover to flex. Not that strong. Youll have to space something between the w/p and the cover, and possibly put something a bit more wear resistant on the inside of the cover so the button doesnt wear through. Or, go to the billet cover. Where is the red "fuel pump prime/test" wire located that i need to splice into? Is the x4 LT1 single coil any easier to tune than the 24x coil per cylinder? And two, does the 0411 PCM have any other numbers it goes by, similar to the 165 having mutiple numbers etc. ? And three, is the 98LS1 harness a easy or difficult repin to ExpressVan specs? I just wanted to tell everyone that my 41 Chevy pickup with 0411/Ramjet has been running couple years now with about 5000 miles on it and it is still a pleasure to get in it and drive anywhere I want to. Since I got it running, I have now done a single thing to the engine, and it just runs great. It seems that the just bumping the starter, even after it has sat week or two, and it just springs to life, and runs like ####. This is a great conversion. My L31 350 is 374/368 through a 4L80E and GM 9.5" 14-bolt and runs great as well. Was also very easy to dial in. I found an extra 85MAF harness yesterday in my box of bits so decided to get ready to make a harness for 0411 PCM swap and realised my PCM is not a 0411, it's a 16238212. This is from a 98 Firebird and I have the harness to match. Can this still be used for the 4x / 24x conversion, or do I specifically need the 0411 PCM? Also, how difficult is it to rewire the firebird harness to the express van harness? Keeping in mind I'm in Australia and have no access to S10, Express Vans or trucks to get a harness from. What ECU/PCM would be in a 1998 Holden Suburban 350 Chevy Vortec ? If its the black box its no good. I'd bet it would be close to what we have in the states. I'd think anything with a 350 with a silver pcm should work right? Black box is fine but has a built in rev limiter that can not be tuned out. What does everyone do about the 2 x knock sensor setup? I bought a ls1 knock sensor harness for $40 only to then realise the knock sensors on an ls1 go in the top of the block front and back, as opposed to left and right. I've searched the forums, but no-one really goes into detail about the knock sensor setup with how/where they installed theirs. Yeah, I get the feeling most folks don't even bother and bypass the Knock Sensors altogether- Which in not the way I want to go. 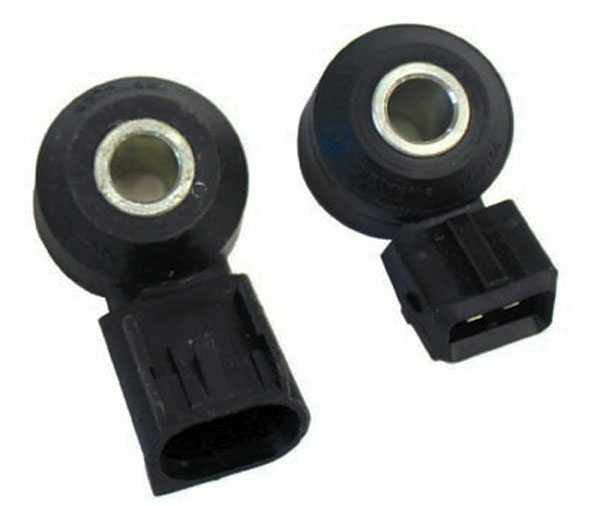 My plan is to use the 'LS' style flat response Knock Sensor but I'm using the style with the 'Injector' type connector vs the rounded LS connector (just was cheaper and more convenient for me). I then had a stud machined that will fit the sensor bolt hole (I forget but it's like 8mm) and the other end of the stud is 3/8-16 so I can bolt it into any available hole in my block or heads (similar to the pic below). I think initially, I will just start out with 1 sensor mounted to the back of one of the heads and go from there- If 2 sensors doesn't buy much more that the 1, I'll probably just stick with the 1. Run the stock knock sensor(s) 1 or 2, out of a 2002 5.7L express van (single wire (standard small block)). You can configure the 0411 for that type of sensor and any of the three conditions 0/1/2 sensors, at least run 1 though. I have read this entire thread and I haven't seen an answer. Can you just use a computer and OS from a 2000 Camaro and repin for the firing order change. I know you can change the bank designations with HP Tuners. That way I could just run 58PSI on the fuel rail along with 2000 Camaro injectors. I believe the computers themselves are physically the same from 1999-2002. You can put an OS from a 2001-2002 Camaro in a 1999-2000 Camaro or Trans Am and gain the extra tables from a 411 PCM. Your best option is to run the LS1b (1999+) ECU, change the pinning on the Coils and Injectors and the bank assignment for the injectors. You can get a LS1b out of a lot of vehicles, you can look on tunfiledepot for reference to what year had what ecu. The LS1b allows an IAC to work, I'm not sure what if any other functions it does that the LS1A (1997-98) doesn't do. You can run the 58 PSI if not using a vacuum style fuel pressure regulator, just don't change the scaling (which should be a constant) in the B4001 table. The ECU is adjusting the injector flow rate based on the MAP value. 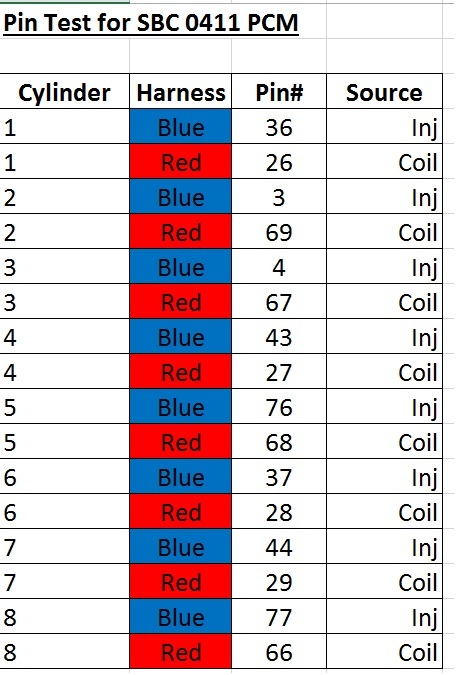 If your going to use the vacuum style regulator than this table needs to be a variable since the vacuum of the motor is regulating the fuel pressure to a constant instead (there is a spreadsheet that helps with this if using different injectors). I already have an entire 1999 donor car. I will be using the fuel system including the regulator from that car which will maintain the 58psi at the rail. I am just wondering what the benefits of using the express van OS has. The benefit is you don't have to install coils. I think that's about it. Motor is built, just have to bolt the HSR intake on, drop into the car and I'm ready to go. TPI had MAF Burnoff relays, MAF relays etc... Does the 0411 Require and relays, or are they all internally controlled in the PCM? I've removed all wires from the engine bay, and just have the body harness plug to attach for alternator, main fuse panel wires, headlight/wiper/accessories etc. So do I need any relays, or all will be fine? Hmm.. didn't get any responses to that so for now I'm not worried and not running any relays. Hit many a problem with my build including, truck serpentine brackets (didn't know there was a difference), header issues with spark plugs, and all kinds of issues with the motor itself, but its all ready to drop in. Before I do it though I want to make sure all the sensors are the right ones to use so I don't have to go climbing around in tight spaces to refit anything. Oil Pressure - what does the 0411PCM need for this? Is it essential? What does the 97firebird gauge cluster need for this to work, does someone have a part number for the sensor or a compatible model I can search? O2 sensors - I have 2 to go in the exhaust headers, but where should I install the wideband o2 sensor? Spark Plugs - what heat range should I use? The AFR heads I have are angled plug heads which require 3/4" reach and I need something with a 'nub' for a porcelain head as it needs to be short as possible to fit with the headers. Lastly, do many people run MAFLESS or keep the MAF & MAP setup? Is either easier to tune / safer to run stock(untuned) for the motor? Need to discuss how you guys with TPI throttle body are adjusting your idle speed with the 0411 changeover. I can't seem to get my idle speed correct. The OBDI way of shorting out AB pins on ALDL, and unplugging TPI and IAC sensors doesn't seem doable because of different ALDL, and completely different computers. I tried unplugging sensors to manually adjust, but engine goes dead if they are unplugged. I've probably missed something simple. My motor is ready for starting, well I'm ready for it to start but apparently it's not. Cranks fine but no fire. I've got to check a few things this afternoon, VATS is disabled, but the OBD2 port was wired in wrong so I can't pull any codes at the moment. I'm worried about the distributor position being wrong but I think I dropped it in correctly. Lastly the power for the coil packs, is there 1 or 2 feeds for that. Initially I found there was no power going to one side, so I tricked the supply wire down to one of the C100~ connectors (a light green wire) but is there going to be a separate feed wire for bank 2? And lastly, in the Pinout for the 0411PCM makes reference to 5v and 12volt wires for various sensors... Is the PCM supply these voltages to the sensors, or should these have voltage going to them? I assume as 5v is in the mix that the PCM is supply these and downvolting to 5v where required. Got everything above sorted, but now it just coughs, splutters and backfires while trying to crank. I've reseated the distributor a couple of times now but it doesn't seem to want to start. I've followed the vortec distributor install guide on GMT400 trucks forum, but it still doesn't seem to work. Does anyone have any tips on getting it installed correctly? What am I missing here, and how much can it be out by before the car will start (even if its just a rough idle)? Whats the play level here to get it to start, or does it need to be exact before anything resembling a running engine will happen? Has anyone else had this problem and do they also have bad backfiring and horrible spluttering when its out of sync? Just a thought-because Ive done it myself (with the same results)-did you possibly run the spark plug wires backwards? This is the pin reassignment I used to convert the firing order from LS1 to SBC. Can anyone confirm if it's correct? Last edited by evilstuie; 07-14-2016 at 08:15 PM. As in the firing order is backwards at the cap. Instead of going clockwise, it is wired counter-clockwise. There is no cap, its coil per cylinder. Anyway its all sorted now. Turned out the coil packs had been rewired to some bizarre firing order, I'm assuming for a custom cam, but I repinned the PCM based on the individual coil plugs instead of the coil pack plug, and all is good. She fired up! Engine: 92- V6, 86 305 carb. i also have been contemplating the same system on a TPI. Spoke to Howell Engineering about it, and they said that would be too much work. However, I believe having HP tuners and using the 0411 computer with Vortec components would make tuning much easier than OBD1 seeing a I do not have a prom burner. Thumper: Make SURE you do your research. I did the same thing and it was a pain in the *** with multiple purchases of the wrong parts. Then make sure your flexplate matches your torque converter bolt pattern and TC nose fits in the 400 crank. Then make sure the converter is for a 1 piece style 4L60E not the removable bellhosuing, as the spacing is different. Then after all of that, make sure you have a crapload of RTV sealant for the plastic timing cover, make sure you get the right cam and cam button/plate. And right timing chain and sprockets (single HD roller I think). There's a complete guide to making your own harness start to finish if you search, its been stickied. Otherwise if you do a search for my posts it should link you to enough of the threads to get the remaining info you need.